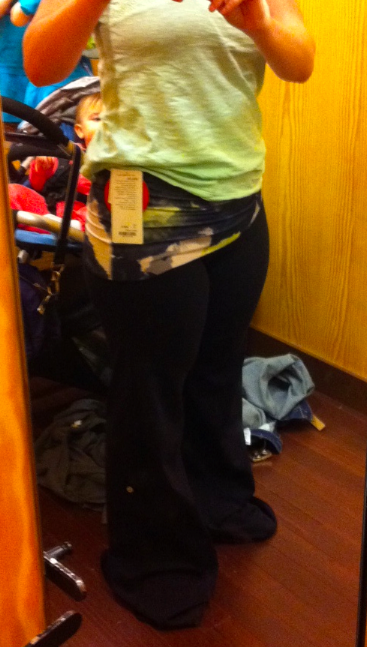 I tried on the Waltz Pants (retail for $98) today fully expecting not to like them. I saw them in store yesterday and there were things that sort of turned me off of them and so I poo-pooed them and didn’t give them a fair chance. The things that turned me off at first were the unfineshed edges on the bottom hem and at the bottom edge of the waist fabric. It’s basically a raw edge with a surge seam over it which makes it look really casual, especially since these are luon light and not the regular weight luon used in Still Pants or Relaxed Fit Pants. I was worried that the waist would be really lose fitting, sag down or just not feel supportive enough around my waist so that it would stay put. The pants are reversible so the waist panel fabric is not stitched down so you are able to flip it around the other way and adjust how it sits on you. I also didn’t care for the Canvas Print on these ones that I tried on but I wanted to see what the waist fabric looked like in stark contrast against the black pants so thats why I chose those to try on. Also, I thought these pants had the hidden cinch cord at the bottom that lets you adjust the length into crops or to save you from getting them hemmed but they actually do not. As soon as I tried these on I was in love. I found the waist very comfortable and supportive enough that I don’t think I would be constantly hiking them up. 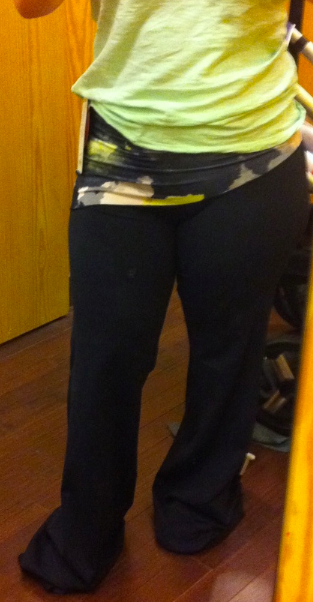 I tried them on in a size 8 and I’m between an 8 and a 10 in bottoms (10 in Wunder Unders and Wunder Grooves, 8 in Pique Grooves Relaxed Fit Pants and Lulu Pants). I found the large panel of contrast fabric at the waist really, really flattering and feminine. Sadly I’m wearing a non lulu loose fitting shirt that doesn’t allow you to see how lovely the waist of these pants look, but with a Cool Racerback, Power Y or Modern Racer the waist of these will accentuate a curvy waist and flatter large and small hips alike by creating balance. I really like how the band at the waist balances your lower half with a slightly flared leg. The pants were very long on me and would need to be hemmed so that you see the full affect of the flared leg but I wanted to show you these pants on a fuller figure without yoga proportions. I ended up passing on these today because I didn’t get to try on the blurred grey/coal version or the solid black which are the ones I most like. I would love to see these in black with a pink mist waist. The Blurred Grey/Coal may go on my Upload Thursday wish list. There is no adjustable hem on these pants so this picture shows the additional fabric used to create a knot. I really like this color in the pants. This picture came in my product alerts today but when I click on the image it took me back to the Lulu website and not the product description page. "Chai Time Pullover – Wear Over Time"